I have gotten so many questions about this lately, and something tells me that it’s not just me that is excited to start organising for the new year. 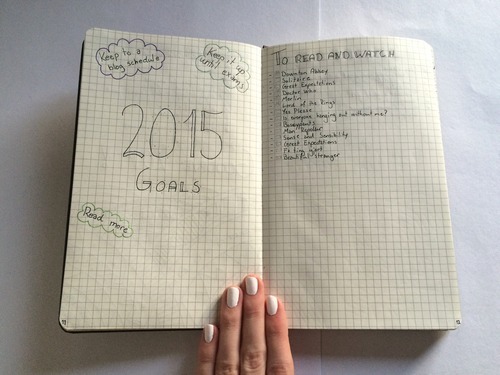 Oh yes, and by the way, happy new year and welcome to the first official post of 2015. 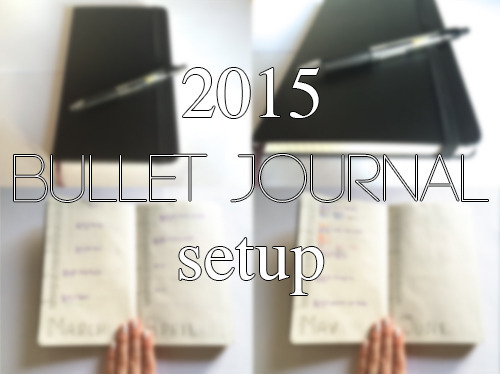 Now let me try to walk you through what will probably be a very image heavy post about my 2015 Bullet Journal Setup. This is what I use for my bullet journal. It is Moleskine Large Squared Notebook. It works perfectly for me. It has a hard cover and an elastic closure, which is super convenient when I just throw it in my schoolbag and bring it with me. The size is also good for this; enough room, but not so big that it’s a hassle to bring with me. As for the pen I mainly use, it is a pilot G-2, which I absolutely love, because the grip is perfect and it writes really smoothly. I also have some coloured pens that I use, and they are of the Stabilo brand. I’ll get to the colour coding in a bit. I thought I’d do this post in a walkthrough style, so i’ll just flip through the notebook and show you guys the order that everything is in. On the inside of the cover I’ve stuck on my master task list. 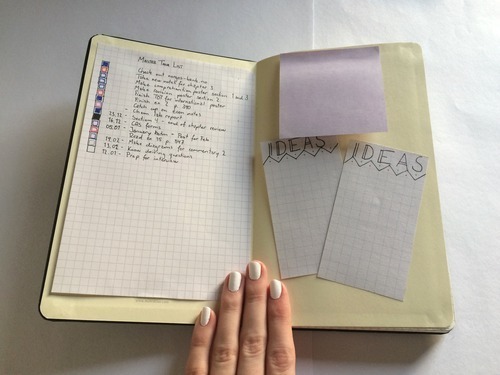 This replaces the monthly task list that you find in the original bullet journal. Since I’m still in school, I mostly operate in terms, rather than months. However, i also have things that go over several terms, so I just work with a master task list instead of a separate one for each term. Here I just write everything that I need to get done, with due dates if they have a time the tasks need to be done by. 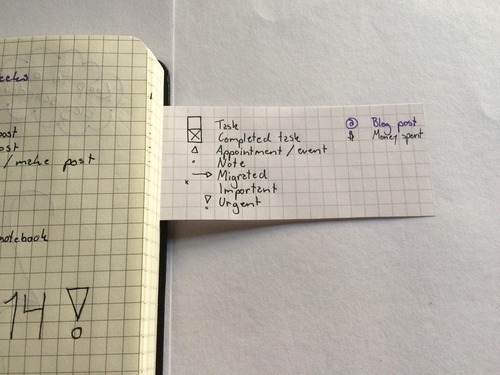 On the opposite side I just have my personal information underneath the sticky note and two small “Ideas” post-its. Flipping to the first spread, I have my index. I reserved a double page, but if that’s not enough I’ll just make a new one and put a page marker on it. Here I just put all the entires to my bullet journal, so that I can easily find them later. For the first section of my bullet journal I have six of the traditional bullet journal spreads, just so that I can forward plan. 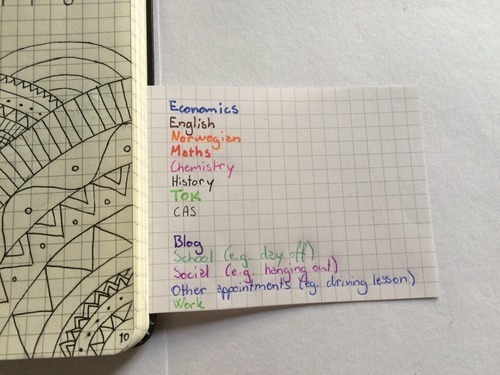 As a student, it is important for me to be able to plan further than a month ahead. Since I don’t like to reserve space for my dailies, I just put all the spreads in front. 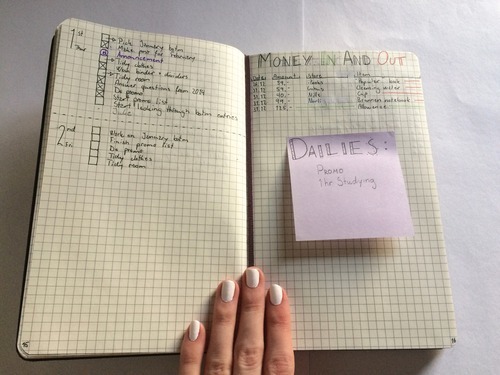 Here I put due dates, when I’m hanging out with friends, days off from school or any appointments I have. I think that when I get to May, I’ll make the six new spreads. Or maybe when I get to June. We’ll just see what fits the best. Anyway, June/July is a good place to have that break, I think, as that is a time of year when I don’t have that many appointments and things going on. I have my exams in May, but I didn’t feel like I’d have enough space to fill out all information in the monthly calendar, so I made an exam schedule. Here I fill out the date, time, subject, number of paper and everything. It’s nice to have it there to look it up. 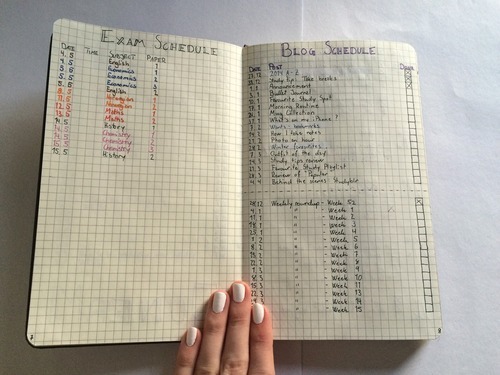 On the opposite page, I have my blog schedule until May, so you all have a lot to be excited about on that front! After my schedules I did my December dailies. 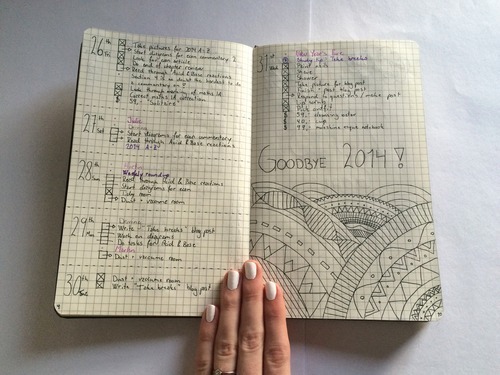 This is what a typical page in my bullet journal looks like, minus the extensive doodling. Here i write everything that I have to do, including any blog posts I’m putting up, any appointments I have or if i’m hanging out with anyone. 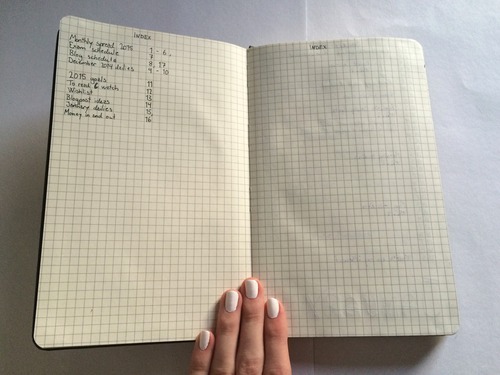 I also have my to do lists here, and it’s so nice to have everything gathered in one place like this. As I finished my december dailies, I decided to do a bit of a 2015 goal page, where I wrote up some of the things I want to focus on doing in 2015. Most likely I’ll fill it up further as we get into the year. On the other side I have my “To Read and Watch” list, which is a list over movies, tv shows and books that I want to get through this year. I find lists like these super helpful when I need something new to entertain myself with. 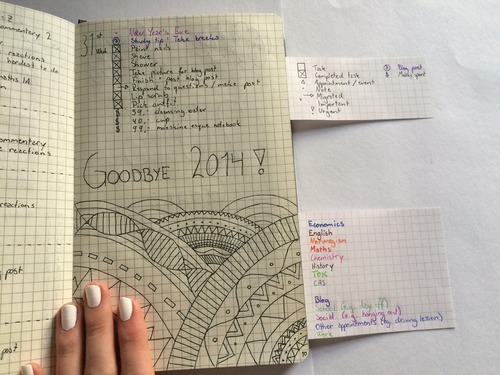 This spread has my Wishlist on one side and some blog post ideas on the other. On my Wishlist I put anything that I think of that I might want to buy, so that when I have some extra money and want to treat myself to something I can buy myself something that I’ve been wanting. In-between the pages I taped this little “Stay Inspired” card that I now look at every time I flick to the page of my blog ideas. It really is a nice message to see every time I want to start a new blog post. 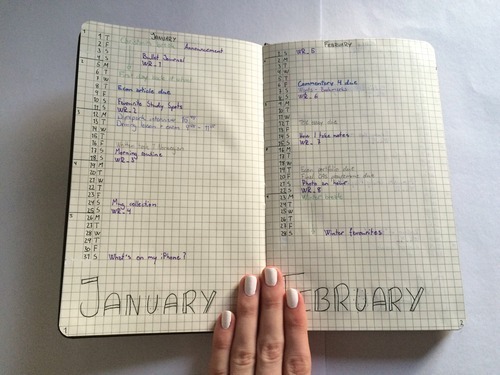 This is the start of my January Dailies. I also made a post it note with the title Dailies, where I can write stuff that needs to be done every day, so that I can move that forward with my daily entries to remember to put these things on my to do lists. At the moment it says “Promo” and “Studying”. On the other side I have a little Money page, where I record what money I spend and what I receive. It is by no means a serious thing, just more to see what I spend my money on. 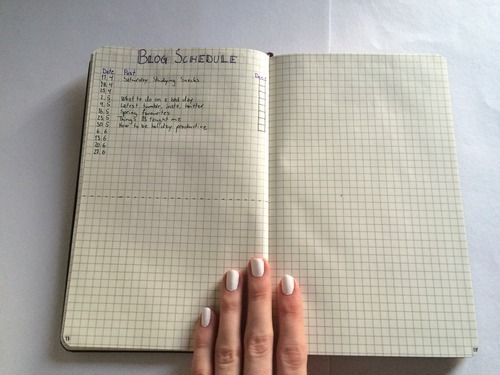 The last page I have started as of now is my second blog schedule, which is the one for May. This will again be helpful for forward planning. On these schedules I also have boxes where I cross of whether the post is finalised and posted or not. These are the my keys. I drew them out on graph paper and stuck them to the back of the notebook so that I can flip them out and still see them while I have my daily pages open. The top seven colours are for my different classes, and I use that to differentiate homework, tests and stuff without having to write out the separate class names every time. This is basically the way I organise my bullet journal, and I tried to keep the symbols minimal, so that it wouldn’t be too much of a bother. So there you go, guys. This is my bullet journal as off right now, and I am really happy with the way that I have it set up. 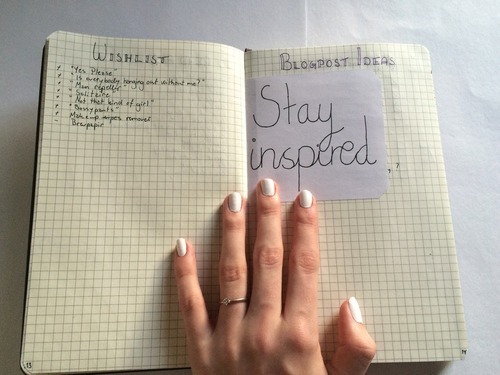 I’d love to see you guys’ bullet journals, so if you make a post about yours, tag it with maryplethora so that I get to see it!